Do snowstorms disprove global warming? The two snowstorms that hit the U.S. east coast in the past few weeks have been touted by many climate change contrarians as proof that the theory of global warming is incorrect. Much of the focus was on Washington, DC, because that’s where media people and contrarian politicians are concentrated. Here I examine the many errors associated with this line of thinking. First, contrarians argued that snow equals cold, and therefore that an unusually large amount of snow means unusually cold. Of course this is a logical fallacy: anyone who has lived in a snow-prone area like my hometown of Buffalo, NY knows that unusually cold means less snow, because very cold air holds less moisture. Large snowfalls are usually associated with warm, moisture-rich air. In Washington DC it is usually cold in enough in January and February to snow, so what was unusual about the two snowstorms was how much snow fell, not how cold it was. Thus, people were confusing precipitation and temperature. In fact, the theory of global warming predicts more intense storms, because the atmosphere has more energy, and greater amounts of precipitation, because the atmosphere is warmer and therefore can hold more moisture. The storms on the east coast resulted from warm moist air from the Gulf of Mexico moving northeast and hitting cold dry air from Canada. This caused the warm moist air to cool, and because cold air can hold less moisture than warm air, the excess moisture fell as snow. This was expected because El Nino has been active off the U.S. west coast, and this typically causes more precipitation in the southern and eastern U.S. (note that El Nino events are expected to become more frequent and intense as warming continues). Finally, contrarians were confusing weather and climate. 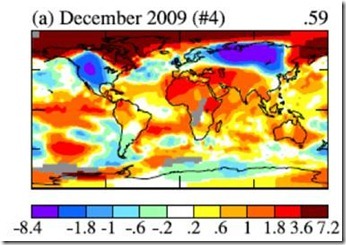 On the short term of weather (days, months) it is entirely possible to have unusually cold temperatures; warming just makes them slightly less probable. But over the long term of climate (years, centuries, millennia) the trend is towards increasing average global temperatures. So when arguing that snowstorms on the U.S. east coast refute global warming, contrarians were confusing precipitation and temperature, local and global, weather and climate. Is it possible to get any more confused about global climate change? This entry was posted in Environment, Global warming, Science. Bookmark the permalink.